Dutch club RKC Waalwijk have denied reports coach Martin Jol is set to leave to become assistant manager to new Tottenham boss Jacques Santini. 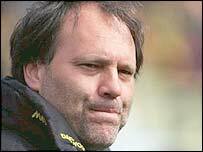 Jol was believed to be on a shortlist of names drawn up by new Spurs director of football Frank Arnesen. But a statement to BBC Sport from Waalwijk said: "There has been no contact between Tottenham Hotspur and RKC Waalwijk about Martin Jol." Jol was linked to a similar move to Manchester United earlier this year.